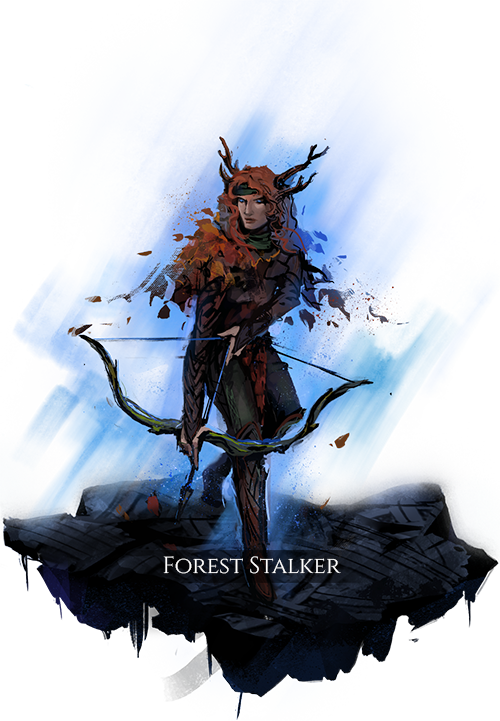 These archers are renowned for using very powerful weapons that have a shorter range than the weapons of many of the Forest Stalkers’ counterparts. However, within their own forests their camouflage abilities are the most powerful in all the Realms. They are adept at using poison on their arrows, as well as at calling on the forest to aid them in delaying groups of invaders. One of their abilities is the power to call on trees to create arrows for them. None will live that defile our home. Equipping items crafted with metal materials reduces the user’s concealment, as well as damage with bow abilities, for each item equipped. Greatly reduces preparation and recovery times on bow abilities, but increases their stamina costs and reduces their damage slightly. Seeds this arrow with a plant that buries itself in the ground when it lands. It then latches onto nearby enemies, reducing their movement speed the further they move until expiration, or until the plant is destroyed. Seeds this arrow with a plant that buries itself in the ground when it lands. If the plant isn’t destroyed, it will burst after a short duration, releasing a cloud of spores. Any enemy within the cloud will suffer life damage, and have a life debuff applied to them that reduces their vision and increases the stamina costs of their abilities for a moderate duration. Seeds this arrow with a plant that buries itself in the ground when it lands. The plant quickly grows into a massive vine that lasts for a long duration. The vine lashes out and knocks back enemies that come into contact with it, dealing crushing damage and also applying a physical debuff that reduces the disruption health of their abilities for a moderate duration. Emits a vaporous wave of spores in front of the user. The cloud applies a life debuff to enemies it affects that greatly reduces their vision and suppresses their ability to block or deflect incoming attacks. When the user dies, vines erupt from their body to greatly increase the size and power of their other nearby plants. Vines from Rampant Overgrowth also lash out at nearby enemies, applying a poison debuff that deals poison damage over time.